The AT&T Center in San Antonio, Texas better be prepared for the high-level talent headed to the venue capable of holding over eighteen-thousand people. This Saturday, June 28th, the Ultimate Fighting Championship (UFC) will host UFC Fight Night: “Swanson vs. Stephens” in the Lone Star State and Albuquerque, New Mexico will be well-represented. From the headlining act to the opening bout on the Fox Sports 1 preliminary lineup, Albuquerque will significantly impact the fight card. Included on the fight card, a long time member of the Jackson-Winkeljohn fight team, two fighters recently linked to the Jackson-Winkeljohn gym, and one homegrown product representing Tucumcari, New Mexico and Albuquerque’s FIT NHB gym. The featured fighter of Saturday night, Cub Swanson calls Albuquerque his home-base as his primary training for years has been located off of Acoma and San Mateo at the Jackson-Winkeljohn MMA gym. Swanson will be fighting in his sixth UFC bout and first headlining act after amassing a five fight win streak that includes notable wins over Ross Pearson, Dustin Poirier and Dennis Siver. Knocking on the door to title contention, Swanson will draw Jeremy Stephens as an opponent that could very likely cement his place atop the 145-pound Featherweight Division. Swanson is one of the division’s most prolific strikers and one of the UFC’s most emphatic finishers. During his five fight win streak, Swanson has notched four finishes via strikes. His conditioning has definitely been a major factor as Swanson has TKO finishes in the first, second and third round and went the distance with perennial title contender Dustin Poirier. Swanson will be joined by teammate Colton Smith and Anthony Hamilton on the fight card. He lost a razor close decision in his UFC debut, FIT NHB’s Ray Borg will be back in action this Saturday looking to bounce back from the first loss of his young, short but already prolific professional career. Colton Smith is the Ultimate Fighter Season 16 winner and with a 3-3 record, is one of the most complex fighters to analyze from this fight card. While his professional record doesn’t resonate any considerable excitement at .500, Smith is ultra talented and extremely well-conditioned. Smith has fought two very game opponents in his two fights since winning the Ultimate Fighter and he will not get an easy match-up as he stares down two consecutive losses. Smith will take on Carlos Diego Ferreira, the Legacy FC veteran and Texas native. Ferreira is 9-0 in his professional career and brings with him a tremendous amount of hype into the UFC Octagon. The heavyweight Anthony Hamilton plays an important role as a main training partner for Travis Browne here in Albuquerque and is a very talented fighter himself, riding a six fight win streak heading into his UFC debut. Hamilton will be taking on Alexey Oleinik, a fighter with 60-fights of experience to his name. The debuting Hamilton has spent significant time with the Jackson-Winkeljohn gym and his arrival to the UFC is one fight fans should definitely pay their attention to as Hamilton has knocked out four of his last six opponents. 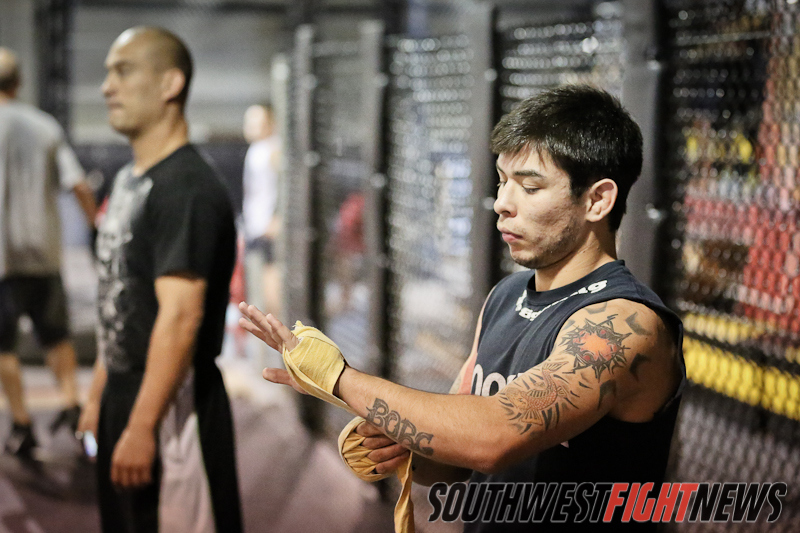 Ray Borg will be the only homegrown talent in action on Saturday night, the “Taz-Mexican Devil” hails from Tucumcari, New Mexico and trains out of downtown Albuquerque’s FIT NHB. The 20-year old phenom is on an unprecedented run to the big show as he is only seven fights into his pro career that has spanned less than two years. The grappling wizard notched wins over Santa Fe’s Angelo Sanchez and Jackson-Winkeljohn’s Nick Urso during his impressive regional campaign before getting the call from the UFC to join the elite ranks of the Flyweight Division. Fighting on two weeks notice, Borg would raw Top 15 Flyweight Dustin Ortiz for his UFC debut. While many (most) believe Borg won the three round affair with Ortiz, the judge’s ruled otherwise handing the Split Decision to Ortiz and dealing Borg his first career loss. In a rare scenario where a loss boosts your career, many who watched the bout pegged Borg as a fighter to keep an eye on and quite possibly one of the best fighters in the wave of young hybrid martial artists currently taking over the sport. Borg will have his chance at redemption this Saturday as he takes on UFC newcomer Shane Howell. The Oklahoman Howell will play the role Borg filled into in his last bout and the duo have the right ingredients for a “Fight of the Night” type performance. Borg is a dynamic striker with world-class grappling and Howell is a finisher who can end the bout via strikes or submission. Both of these fighters will come out hungry for their first UFC victory and the real winner for this bout is the fans who will be tuning in. Tune in Saturday night to Fox Sports 1 at 5:30 on UFC Fight Pass for the event’s first fight featuring Anthony Hamilton. Starting at 6:00 PM, the Fox Sports 1 Prelims will begin and Ray Borg is slated to be the opening bout. As the evening continues, Colton Smith will headline the preliminary portion of the fight card and Cub Swanson will headline the main card. The event is full of intriguing match-ups and with several locally trained and homegrown fighters included on the card, this free event should definitely be on your calendar!